In 1994, retired football star OJ Simpson, lead police on a car chase through Los Angeles in a white Ford Bronco. He had been accused of the double murder of his former wife Nicole Brown Simpson and her friend (presumed lover) Ron Goldman. The chase was at a fairly low speed and the world watched as a helicopter flew overhead broadcasting the entire event live on television. The media circus that resulted was only accentuated by a then publicized court trial that followed after his voluntary surrender. Nate Lowman was 15 years old the year of the Simpson escapade. 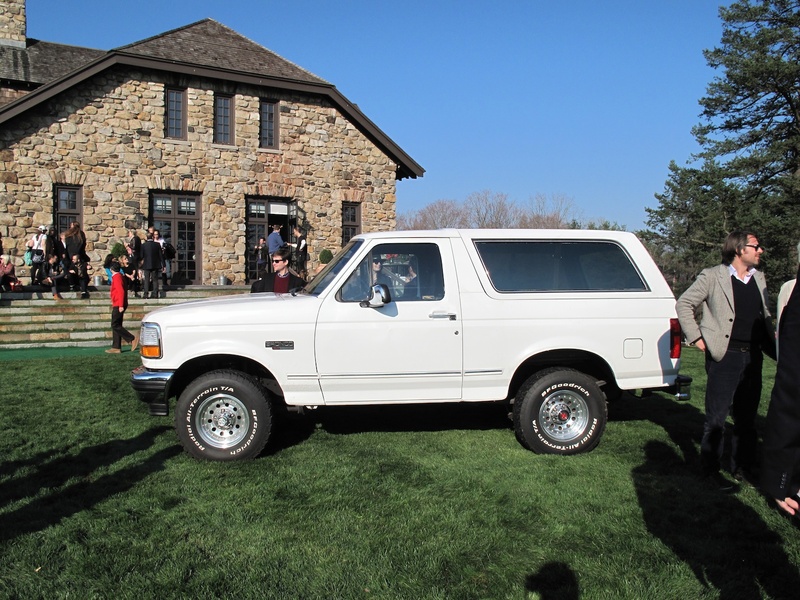 However, the event must have made quite an impression because for his first major solo exhibition titled, I wanted to be an artist but all I got was this lousy career, the original, OJ Simpson Bronco sits gleaming white against the perfectly manicured lawn outside of the Brant Foundation. The Bronco was rented for the duration of the exhibition and as a modern day relic silently comments on celebrity mythology. The usage of this particular vehicle in the context of an exhibition represents the histrionics of a recent past, wrought with a voyeuristic interest between the general public and celebrity culture, us versus them. In the rolling hills of Greenwich, Connecticut it’s not difficult to be reminded of the us versus them mentality, as it is one of the richest towns in America. Beyond the exterior terrain of the exhibition, most of the work extended into the Brant Foundation Art Study Center and by the amount on display, it is obvious that Lowman has been quite busy. Two floors of the interior were filled with his artwork, tastefully installed, in certain areas almost extending floor to ceiling. For a young artist, his work is quite sophisticated, if even a newly revised punk, commenting on popular culture, religion, history and politics. Going through the galleries was not unlike entering a very recently buried time capsule with outward diaristic qualities even if also somehow void of direct emotion. Working with a variety of media ranging from painting, collage, and sculpture Lowman takes us on an adventure commenting not only on a the art world and the historical resonance of time but also his own place and part within this construct. He points the finger and in a metaphorical way, eventually leads himself to a mirror. Whether the intent is a social commentary or a brief documentation of sorts referencing a particular time doesn’t necessarily matter. 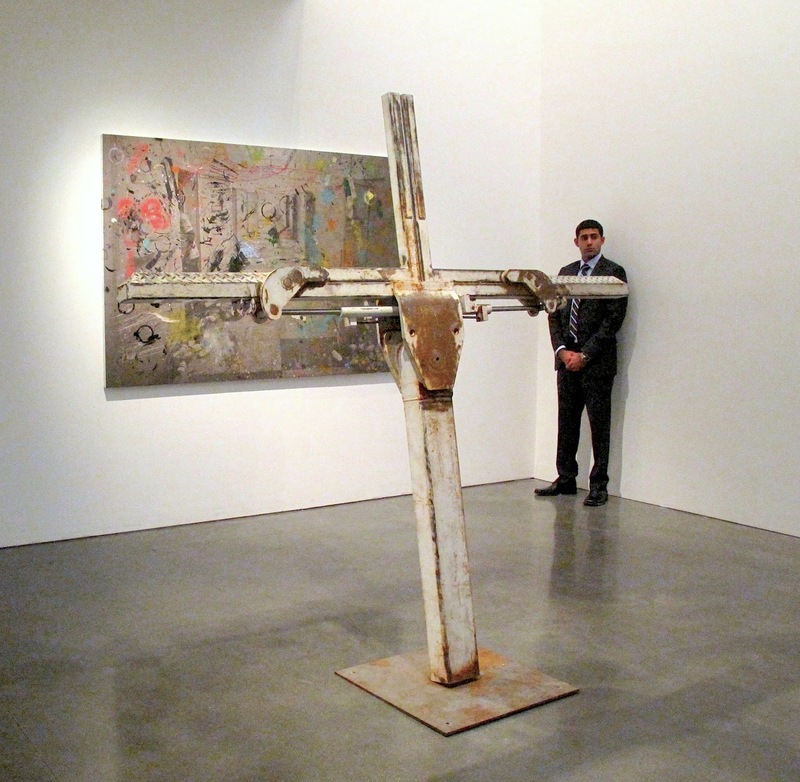 Materials range from stretched canvases to large, metal sculptures made from New York City tow truck equipment. His choice of utilizing both highbrow and lowbrow materials is just as relevant to art history as is his interest in comparing bullet holes with swiss cheese. Almost as if by default, another rebellious artist comes to mind; Andy Warhol. 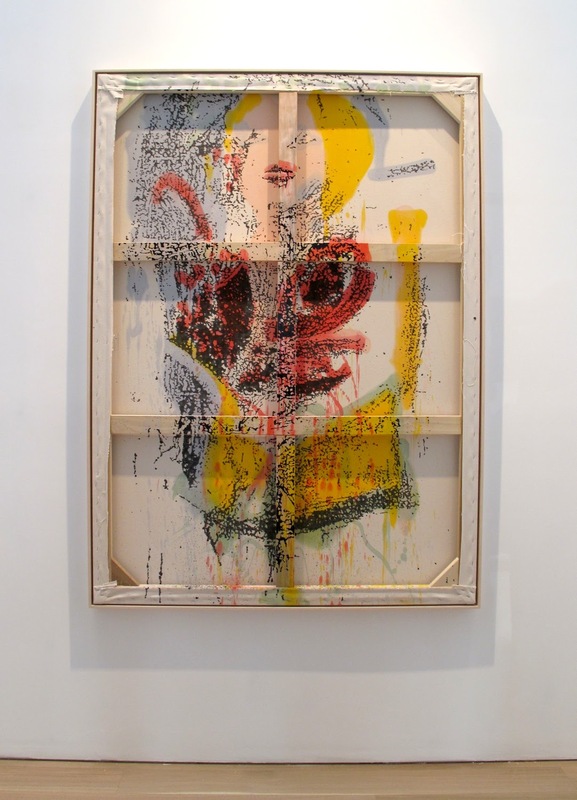 It’s almost impossible to look at Nate Lowman’s work and not think of the infamous silk screen artist. Several of his own silk screen paintings are installed in various rooms of the Foundation and many, in particular, are part of Lowman’s large installation titled Four Seasons (2009-2012) which takes on such subjects ranging from an individual falling from the World Trade Center during 9/11 to a silk screen of a movie poster from a 2005 horror film titled, The Descent. The lower level is less of an aggregation of collected or reproduced images and rather argues for an aesthetic contemplation on traditional painting and sculpture. Here, Lowman fine tunes the narrative content with what becomes a symbolic journey rather than a figurative one. He dives head first into a wall with perfectly stretched painted canvases made to reinterpret pine tree air fresheners and the globally recognized logo of Apple computers. In physically removing the figure he subtly reveals more about the stereotypes that assist in defining a population or in this case, a personal, yet global experience. In both an act of self commemorating and ironic notion, Nate Lowman conjures moments of nostalgia (whether imposed or actual) by way of humor and semiotics. His is a world that many of us may not ever frequent but are part of, even if vicariously, on an almost daily basis.